I am a Bhutanese woman living abroad. Without trying to make the statement sound like an epiphany, I know my story is the story of many other Bhutanese women who have left our country deep in the mountains of the Himalayas to live elsewhere to seek better economic opportunities for ourselves and our families. It is the universal story of the economic migrant leaving all that is familiar and dear in search of that city of gold. When my husband Sangay and I moved to Manila in the spring of 1990 after he accepted a position as a Young Professional with the Asian Development Bank, we believed we would only be there for two or three years at the most. Before we knew it, five years went by and then a full decade. The two major milestones for us during those years were the birth of our two sons. The bustling metropolis of Manila with its gleaming skyscrapers was where they grew up and looked upon it as home. They saw the majestic sight of the Tashichhodzong set against a backdrop of paddy fields and gentle willows growing alongside the riverbanks of the small and modest town of Thimphu only once a year when they travelled to their native country. It was their holiday home. I never imagined that we would end up spending over a quarter of our lives in this land of white sand beaches and happy people. But then the Philippines has its own way of bewitching visitors who flock to its shores. Look what happened to the Spaniards who came with the Portuguese explorer Ferdinand Magellan in 1521. They went on to stay in the island archipelago for over 300 years. It became a long-standing joke in our house that Sangay joined as a Young Professional and gradually over time, he was elevated to the position of a Middle Aged Professional. I realised that there were many upsides to living as an expat in the Philippines. As we socialised mostly with other expats, our outlook on life became broader and we developed greater tolerance for views different from ours. At the same time, we did not want to lose our national identity altogether while living here so we continued to follow our cultural traditions and customs in our home just as we would have done back in Bhutan. We ate Bhutanese food at home and spoke in Dzongkha or in my case Kurtöepkha (as I grew up speaking this language with my maternal relatives) and we always observed national and religious holidays. We got together with other Bhutanese families and students to celebrate Losar or the Lunar New Year. We played hosts to many of our countrymen/women who travelled here on work or on holiday as we did not have an embassy in Manila. Joining the Museum Volunteers of the Philippines shortly after my arrival in Manila was very helpful, not only in understanding the Philippines but also in promoting my country to the outside world. With a mixed membership of mostly expats and a small group of Filipinos, the Museum Volunteers were keen to learn all they could about our host country and other parts of Asia. Hence I was able to present Bhutan in many forums through lectures, study groups and even organise a tour as part of a study on the art, culture and religions of the Himalayan kingdom. Among the major lectures that I gave were “Textiles of Bhutan”, “Thangka Paintings of Bhutan and Tibet” and more recently in February 2014, one on “Bhutan… Happiness is a Place”. With its 67 member countries, the Asian Development Bank where Sangay worked also offered many opportunities for the few Bhutanese to showcase our culture. Bhutan became a member of the ADB in 1981. Over the years, we took part in bazaars to raise funds for charities and in the numerous cultural programmes organised by the spouses. In September 2014, the ADB held a monthlong festival on Bhutan with traditional arts, crafts, costumes and photographs being displayed in the main hallway of the building. Films from the kingdom were also screened during the festival. When we first arrived in Manila, few people here knew of Bhutan and the usual reaction that I got was “You are from where? Butuan?” As I found out there is a place by that name in Mindanao in southern Philippines. Since then many more people have come to know of Bhutan and with the setting of the Filipino teen television drama “Princess and I” in some scenic parts of the kingdom, my country became a household name overnight. 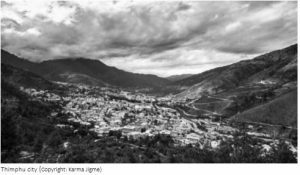 We were surprised that all of a sudden even ordinary people we met in our day-to-day lives knew of Bhutan. The royal visit of Her Majesty the Queen Mother Ashi Tshering Pem Wangchuck to Manila in May 2013 as the guest of honour for the 10th Anniversary celebrations of the fashion magazine Lifestyle Asia contributed significantly in introducing Bhutan to the Philippine society. It was a historic visit as the Queen Mother, accompanied by her younger daughter Her Royal Highness Ashi Kezang Choden Wangchuck, were the first Bhutanese royals to visit the Philippines. To commemorate this special event, we organised a charity dinner on 21 May to raise funds for the Youth Development Fund. There are many downsides to living in a foreign country as well. We are physically thousands of miles away from our aging parents and when they fall sick or die, it takes time to organise the logistics before being able to take a flight home. Both Sangay’s father and mine passed on while we were in Manila. We tend to miss out on the celebration of important family events like births, promotions and weddings. When something momentous takes place in our country like the time some Assamese militants set up camps in our forests in the south and His Majesty the Fourth King personally led our troops in a military campaign in 2003 to drive them out, it became an anxious time for us. Being so far away from the action there was nothing we could do except monitor what was going on in the country through Bhutanese and international media. From my own experience of living outside Bhutan, I have found that my two sons have been affected the most by being raised abroad. Like many of their friends at school, they belong to a new breed of the younger generation called Third Culture Kids (TCK). These global nomads who have spent the formative part of their lives outside their parents’ country are young people who feel that they do not belong anywhere. They suffer from feelings of rootlessness and alienation from the culture of their parents. While they adapt quickly to alien environments and are able to build relationships with other cultures easily, the TCK do not have a cultural identity of their own or strong patriotic feelings. While my older son Rechung was growing up, he often talked about not being able to relate to other young people from our own cultural background and one of his main worries was that he did not feel truly ‘Bhutanese’ as he thought he should. As I discovered, these feelings of anxiety did not deter him in any way from taking part in the International Day celebrations at his school every year when he proudly wore his gho to unfurl the flag of Bhutan while standing in front of a large assembly of elementary school students, teachers and parents. When my younger son Jigmey entered elementary school and it was his turn to unfurl the flag on International Day, he carried out this task with great enthusiasm because his friends told him that our country had the “coolest” flag with a dragon on it. While we continue to enjoy living in the Philippines for the time my husband works at ADB, we also look forward to returning home in the future. We do not expect to find the same Bhutan we left behind all those years ago but a totally different one that has undergone monumental changes and developments. With the collective hope and aspiration of its people for a happy and prosperous nation in the future under the wise guidance of our Kings and elected leaders, what I see shimmering in the distant horizon is a new Bhutan. It is the one that will draw me home. About Author: Kezang Uden Penjore is a journalist by training and a published poet. Her poems have been featured in the anthology Word Weavers. She lives in Manila, the Philippines.